A little bit of Tejada is better than none at all. 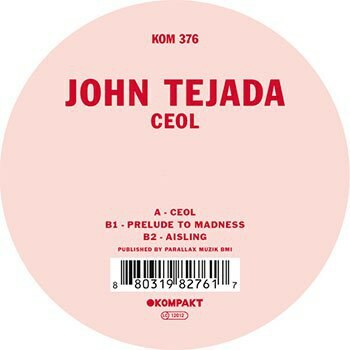 John Tejada, a golden egg laying goose for electronic music, has only been with Kompakt for approximately six years and has only released a few things for them in that time. All the same, the releases he's provided for the German label have helped keep the genre running along the cutting edge, where it has belonged all along. Ceol is a three-song, 18-minute EP brandishing the ho-hum artwork that adorns many Kompakt EPs and singles, but the music certainly speaks for itself. And as is the case with many releases under both Kompakt and Tejada umbrellas, it's the little things that count. Ceol begins with bold purpose. Within just two seconds, the beat and minor chord syncopation are established. There's no room for any ambiguity in the title track's marching menace. Always simmering without ever snarling, "Ceol" slowly dishes out the little pieces of noise that give it its momentum. The one-chord ostinato eventually gives way to something just slightly more involved, but the track never loses the bold purpose with which it began. "Prelude to Madness", the first track for side B, starts with a dreamier foundation. Two chords from a soft pad setting set the stage for low-end burbling and some nifty hi-hat settings. At the halfway mark, "Prelude to Madness" introduces its best feature in an analog dip that shows up every two bars. In the meantime, that dreamy two-chord sequence makes frequent reprises, reminding the listener that the trance factor never intended to go anywhere. By the time we get to "Aisling", the bold sense of purpose that set the EP into motion has morphed into something a little less certain. The sequence driving the track sounds more like a rusty hinge than anything from a cool analog synth. But Tejada sprinkles just the right melodic figure on top, sounding like a harp setting with an occasional pitch bending. Where "Ceol" sounded like a dog in pursuit of a scent the moment it walked out the door, "Aisling" sounds like the same dog became a tad distracted and started wandering off in a less certain direction. And there is nothing wrong with that. Sometimes it's fun to watch a dog just wander off, seeing what it can find on its own rather than busy itself with tracking down a smell all the time. Similarly, the Ceol EP has its own miniature arc where a serious hunt is abandoned for a place of introspection, where the contradictions of a metallic sequence and a gentle melody can co-exist no problem. It's easy to be let down by Ceol's short length and lack of (comparatively) wide variety. But fans of both John Tejada and the Kompakt label will remind you that a little bit is better than none at all. Besides, word has it that 2018 will present us with more from both. Ceol will tide you over just fine.